As Assistants in the digital era, we wear many hats. The “not just an admin” statement is more true than ever. Those of you who have read my articles or seen me talk, know that I always highlight the importance of lifelong learning and embracing technology in order to be at the top of our game. 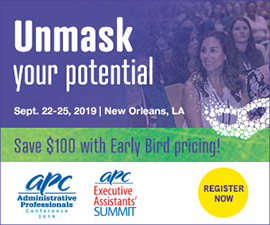 Your well-known organizing skills, flexibility, and willingness and ease to learn the latest tech tools are in high demand. You are most likely using several different digital tools powered by Google, or Microsoft’s many software & services, and you might be looking for “something” to centralize as much of it as possible: a single source of truth. Personally, I find Trello comprehensive and versatile. 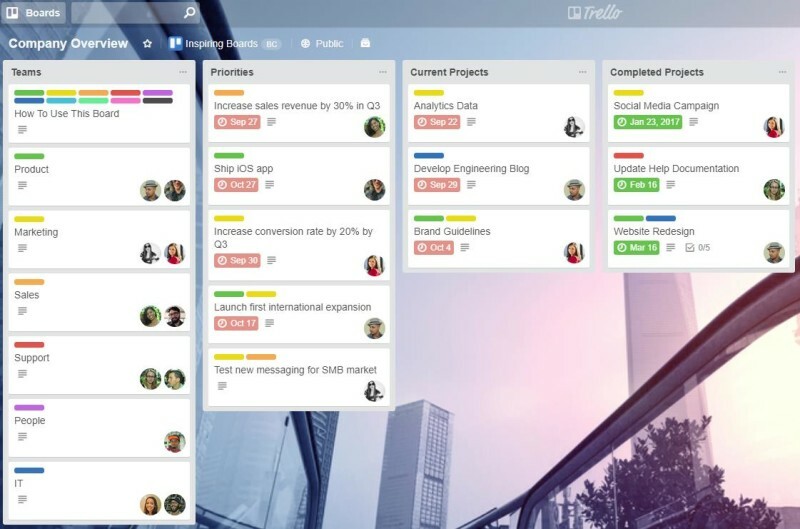 Launched in 2011, Trello is often referred to as a project management tool. 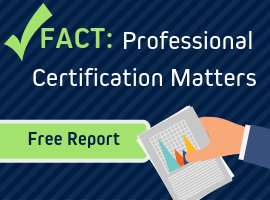 But unlike other traditional project management tools, it has a very short learning curve and does not require extensive training. You can actually start using it after watching their one-hour webinar! How cool is that? And one more thing: it has a free version too. This free version is a great start and a fantastic option for small companies, teams and virtual assistants working for one or several clients. 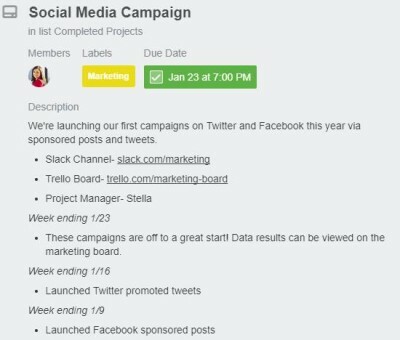 You can create, for instance, a board for your company, with lists for priorities, current project and completed projects. Adding a list with the different teams involved and color-coding them will make it easier to see which team or team member is accountable for each project and the dependencies. In the example below, the board is called “company overview”, the lists created are “teams”, “priorities”, “current projects” and “completed projects” and the cards are shown under each list – for example “how to use this board”, “increase sales revenue by 30% in Q3”, “brand guidelines”, “website redesign”. We can see that the priority for the Marketing team is to increase conversion rate, launch the international expansion with the product team and test new messaging with the sales team. Their current project in is analytics data and they also work with the product team on the brand guidelines. They have already completed the social media campaign. By clicking on the card, we open it and see the information provided by the team on the progress of the campaign. 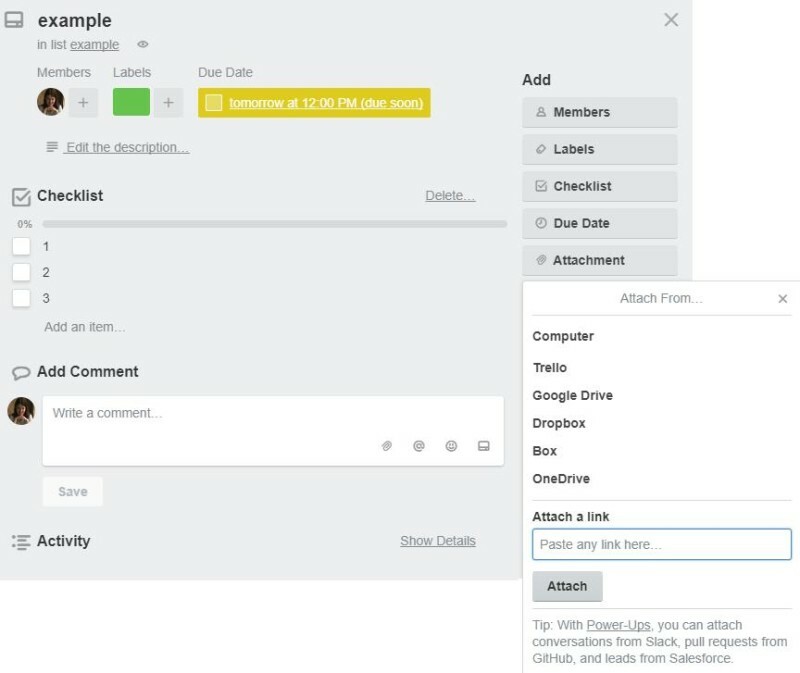 As well as members, labels, due date and description, you can add one or several checklists, comments, and attachments to the card - from your PC and via links to other Trello boards, Google Drive, Dropbox or your personal website. The paid option also integrates Evernote, SurveyMonkey, Mailchimp, Salesforce, Twitter and others, making it easy to centralize and connect the information you have on other platforms without having to physically move it. This gives us visibility on the tasks each team member is accountable for, the timeframe for completion, and the interdependencies. If a team member needs to take unexpected sick leave, you will know which tasks could get affected and be able to re-assign them. Power-Ups not only integrate the apps we rely on, it also provides useful options developed by Trello or third parties. 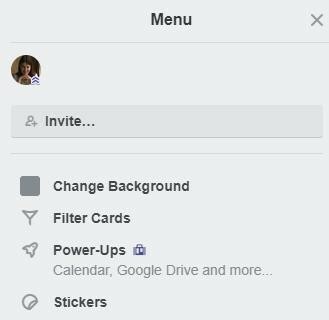 For instance, if you would like to see cards in calendar view, you can enable the power-up called Planyway. It will display cards with due dates, archived cards in a weekly format. You can also enable the Calendar power-up, most useful for time-sensitive projects and projects with multiple due dates. With the Calendar power-up, you can view your board's cards with due dates in a calendar. 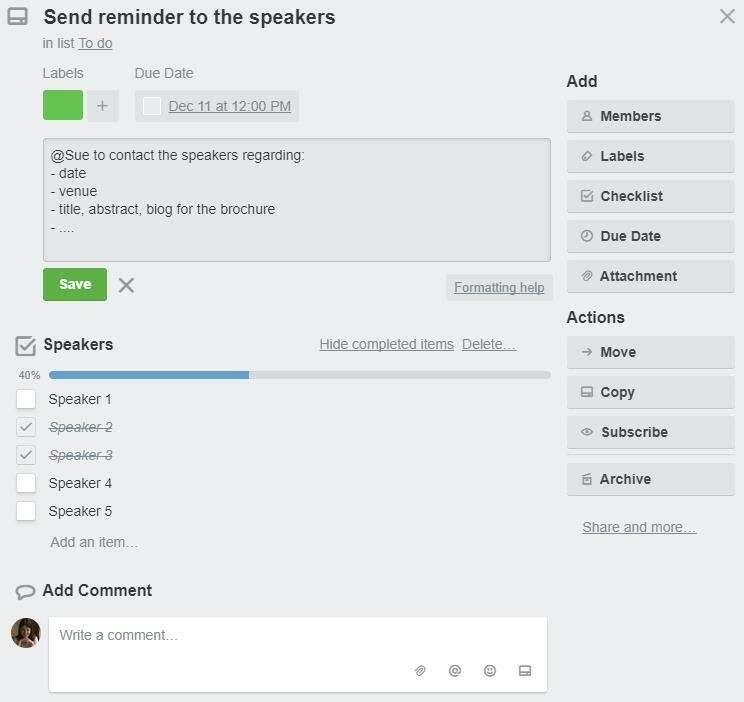 It includes the iCalendar feed option, to link your Trello board with your personal calendar. iCalendar feed can be imported (by copying the URL) into any third-party calendar such as Outlook, Google Calendar, Apple Calendar and more. Another feature that I find very useful is the “Email-to-board” setting. You can generate an email address so that all emails you (or anyone who you give that specific email address to) send, go directly to the list you wish. You can set up multiple email address, one for each list you have on the board. For instance, if you are a virtual assistant or a team of VAs working with the same client(s), you can set up a board with lists like “To do”, “In progress”, “Done” in order to track the status of the tasks. You can send their requests to the “to do” list and then move to “in progress” as you start working on them and “done” when completed. 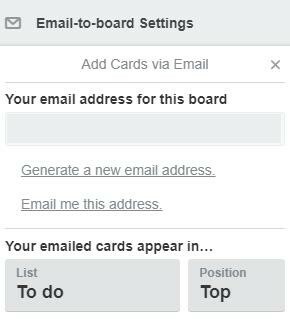 Or create separate boards for each client and use the email-to-board setting so their requests go directly into Trello. You will get a notification each time a new card is created or edited on your Trello board, if you wish. So now that you have set up your board, inspire yourself and your team by adding a cool background color, a group picture or the company logo. And if you love stickers, like me, add some to your cards as well. 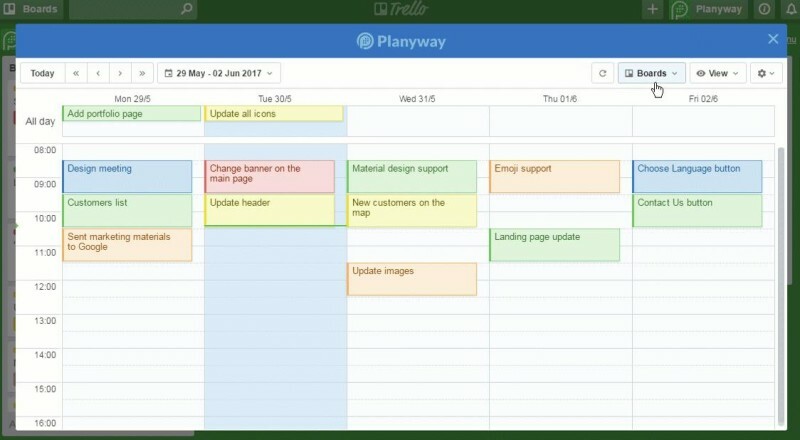 Trello is useful for daily task workflow, project workflow, event planning, as we have seen, but it is a great tool for personal use, as well. Are you planning your wedding, searching for your dream job, organizing a trip with your best friends, moving into a new apartment, or just fancy keeping track of your life goals? 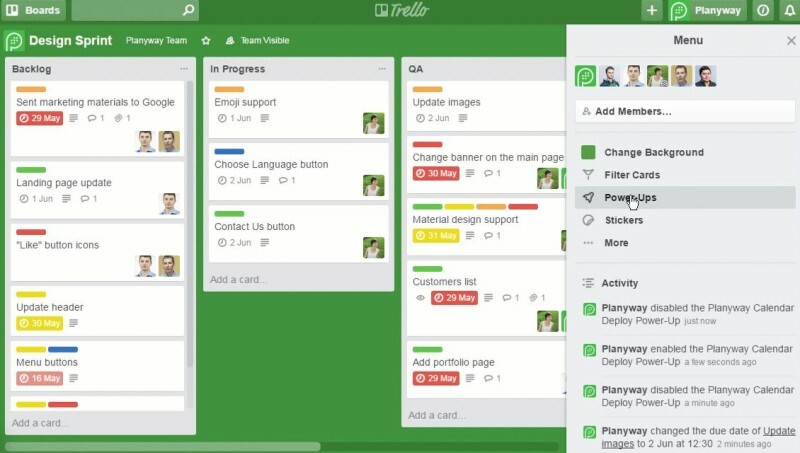 Set up your Trello board and let technology help you. While I was writing the article, I came up with this idea about what a Trello board for Executive Secretary could potentially look like. There are many other options, of course. In the Team list, you could add each member’s contact details, DOB, or other useful info. The list corresponding to the Magazine has cards for each issue; you could add to the cards information about the topics of the articles, authors, whether they were submitted or pending, etc. 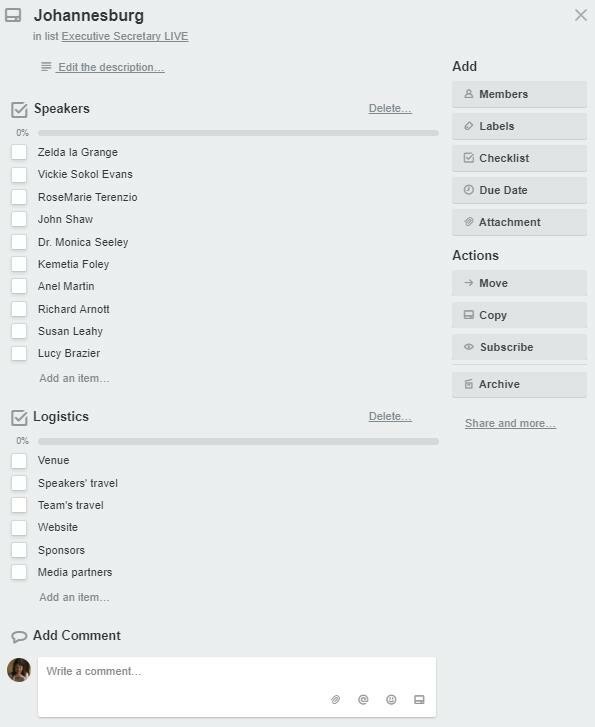 In the LIVE list, a card for each event with checklists, speaker biography attached, and other relevant data might help the team in charge of organizing the events. 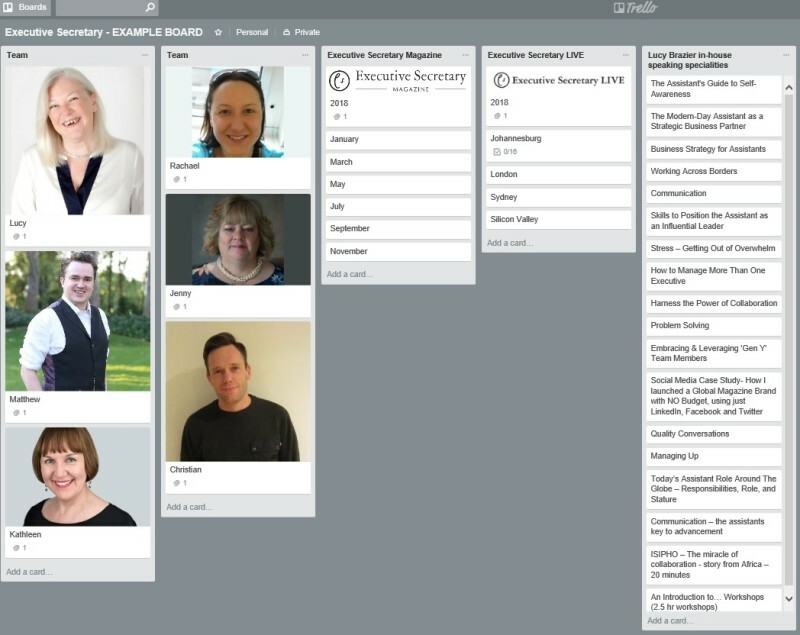 Note that this is just an example; your board can and should be organized in a way that is useful to you, your team and your company. Andrea Macarie is Senior EA to the CEO of Telefonica Alpha. She is an award-winning Assistant with 10+ years of experience supporting C-level executives. In 2014 she was the overall winner of “Excellence Award” given by the European Management Assistants Association (currently IMA). Andrea holds a BA in Translation and Interpreting, an MA in Management Assistance, and a Postgraduate diploma in Marketing. Andrea is fluent in 5 languages and writes and talks about a variety of topics she has formal training and practical experience in, (www.andreamacarie.com).